For the last several years my liver enzymes have not been normal – but just a little high. During my normal physical in the summer of 2015 the blood tests identified continued high values for AST and ALT. My doctor thought is was time to look at this in more detail and referred me to a hemotolgist. He defined many blood tests to be performed. They identified that my iron levels were high – very high. The normal range for Ferritin is 24-336. My test results in July were a little above this range. I had many blood tests performed over the next several months. In March of 2016 my levels were over 3.300 – almost 10 times what was considered normal. Additional tests were performed to try to identify the root cause of the high iron levels. One of the tests would have identified if hemachromotis was the cause – the test was negative for this condition. A liver biopsy was performed – the biopsy showed my liver was normal – with a little fatty liver. The doctor said all of the test results were consistent with hemochromotis – that I had tested negative for. The net is the root cause was not identified. The cause is likely related to either Cronkhite-Canada Syndrome or one of the medications. The hematologist believes CCS is the likely cause as there is a strong relationship between the intestinal system and the liver. I had eight phlebotomies (one a week) that brought my Ferritin levels down in to the normal range. The current approach is to have blood tests performed every 8 weeks with one phlebotomy performed every six months. My iron remains in the normal range – though not as low as the doctor originally targeted. I meet with the doctor in a few weeks to determine if I will continue on this schedule. At the risk of over simplification or being inaccurate – I will attempt, to define a “syndrome” and why it is different than a “disease.” My understanding is that a disease has a known cause. A syndrome is defined by it’s symptoms – so for Cronkhite-Canada Syndrome, it would include the hundreds of polyps, weight loss, hair loss, loss of appetite, hyperpigmentation, loss of nails, etc. However the cause of those symptoms is not known. So if you have a disease and somone else has the same disease – you would be having similar reactions to something similar that is going on in your bodies. If you and someone else have the same syndrome you would both have the same symptoms – but the cause of the symptoms would not be known. I read something that made the most sense to me – it was a progression of the understanding of something that is happening in the body. From least understood to most understood – the progression was; symptom, syndrome, disorder and disease. I have talked with two other individuals that also had or have Cronkhite-Canada Syndrome. One person sold school buses and my sister managed a trade show for school principals and school boards. Hundreds of suppliers to school systems participate in the show, from selling milk to selling buses. This individual was at all of the shows my sister managed until a few years ago when he talked with my sister and said he could not attend for he had this strange illness with no known cause. He started to describe his symptoms. My sister told him her brother also had a similar strange illness. To shorten the story he also had Cronkhite-Canada Syndrome and called me. We talked several times. About a year before I started having the CCS symptoms – I had an accident and broke both legs close to my ankles (fibula and tibia in my left leg and the tibia in my right). I had issues with my left leg healing correctly. I had four surgeries over about a years time. Bob, the bus salesman, had a bad motorcycle accident – I believe it was about 1-2 years before he started having CCS symptoms. Likely a coincidence – but who knows. I asked Ron, the other person that had Cronkhite-Canada Syndrome I talked with, if he had any trauma in his life. The answer was no – the first time he had every been in a hospital was when he was admitted to perform TPN – to provide him nutrients for he had lost 90 pounds. So with a sample of two I thought it was possible that trauma played a role. With a sample of three – likely not. If you would like to share your story please contact me by completing the contact form. Below is a list of doctors that have treated Cronkhite-Canada Syndrome. Most of this information was compiled from the internet. Doctor Baird – who played a major role in my diagnosis and is associated with the Emory Clinic. Someone that has/had CCS and was treated at the Mayo Clinic talks about his experience below. The below link has links to the doctors that treated him. Doctor Lisa Boardman also from the Mayo Clinic was involved in his care. The below link discusses the experience of another person that had CCS. Her doctor was William Sandborn. He is associated with the University of California – San Diego. Below is a story from someone who had Cronkhite Canada Syndrome. I found a poem about CCS she wrote when I googled Cronhkite Canada and blog. I then emailed her and she provided the below story. I created the headline – like her I also diagnosed CCS myself rather than a health professional – you need to “trust yourself” and be responsible for your own health. I believe an illness affects one’s faith – sometimes for the better and sometimes for the worse – at least it did for me. For me I had questions where I did not before. In the end I believe I have a closer relationship with God than before I had Cronkhite Canada Syndrome – however, it took some time to get there. I did not chronicle my journey because I thought I was dying and just didn’t feel up to it. Now, it’s been over ten years and I’ve survived, I can narrate what I thought and felt, rationally. It began in October, 2005. My husband and I, along with my sister and her husband, were vacationing in Escondido, California. I remember remarking to my sister, while we were swimming in the resort’s swimming pool, that I hated the water in the resort. It was too soft, or something, because it made my skin feel funny—like it was dead. I compared it to a Thanksgiving turkey’s skin. She didn’t notice anything, but she felt my skin and said it did feel different. In fact, I had better see a dermatologist. Then I forgot about. Thinking back, my hair had started to fall out. Usually, I had to clean the drain after I showered, but it was noticeably getting worse. I never did call the dermatologist. Fast forward to a week before Christmas. Just before I was about to leave for work, I had the urge to go to the bathroom—an urgent need that felt like diarrhea. I made it but that diarrhea didn’t stop. No way was I going to work—not then—not for a couple of months. The diarrhea never stopped. It poured out of me. I had to wear diapers and change them often because the diarrhea smelled and pooled too much. When I took my shower, my hair came falling out. I was alarmed! I called my primary doctor and saw her that day. I don’t remember if she prescribed anything but she said the diarrhea would stop and I should make an appointment with a gastroenterologist to get a colonoscopy and a dermatologist and endocrinologist to find out what was going on with my hair. I was miserable. Besides my hair just about gone, I noticed that my fingernails had raised up in a mound. I wasn’t eating because it went right though me. My nails started falling out—20! I had no fingernails, or toenails. I also had no hair on my body—no eyebrows—no eyelashes. I called the gastroenterologist and dermatologist and endocrinologist, and I couldn’t get appointments until 6 months later! This was my lowest point. I was dying and I didn’t know what to do. No hair, no nails, weird skin, diarrhea galore, and I was losing weight and there was nothing I could do. I had called my parish to make arrangements to have communion brought to me because there was no way I was going to Mass. I almost asked for the Last Rites. Well, my parish is blessed to have on staff a parish nurse. She came herself. She couldn’t believe what I looked like in just a couple of weeks. I had lost about 50 pounds! Plus I had no hair and no nails and stunk like swill, due to the diarrhea. She saved my life—literally. I would have wasted away in my own diarrhea. She immediately made an appointment with an endocrinologist who was also an internist. I saw her the next day. This endocrinologist took a lot of blood samples but it was when she felt my throat with her fingers that she said, “I don’t know what you’ve got, but it’s not endocrine. But I will help you.” From then on, she became my point person. She stayed on top of the situation. First she said I needed an emergency colonoscopy. She called the closest hospital. Not possible. She called the next closest—no. Finally, she called a Boston Hospital, Beth Israel/Deaconess and found that colonoscopies were scheduled Monday. That day was Friday—perfect. I sat in her waiting room waiting for the colonoscopy instructions to be faxed but I got them. Unfortunately, I couldn’t really follow the instructions. I threw up the solution. My diarrhea was never clear. But I lied my way into the hospital. At Beth Israel I gave all the information they needed. I said I took all the solution, everything was OK. Then when the doctor came in, I told him the truth—everything. I was wearing a scarf on my head and showed him that I had no hair. I showed him my nail beds. I told him I threw up the solution. He said he would have done the colonoscopy anyway. He did it and afterwards, we had a talk. He said I had polyps all through my colon but not the cancerous kind. I had ulcerative colitis. 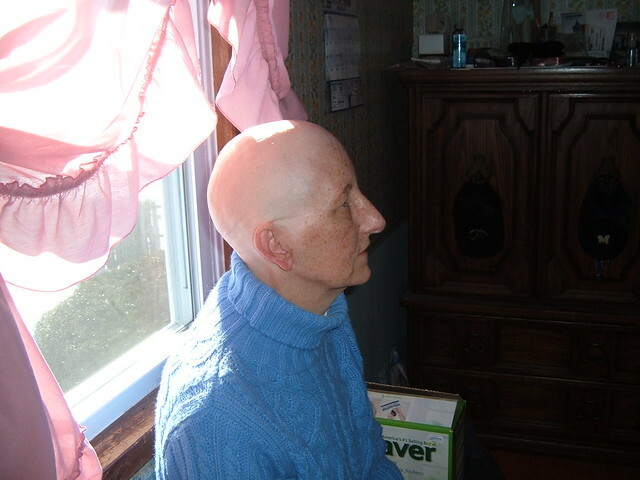 But he didn’t know why I had lost my hair and nails—some abnormality. But he gave me a prescription for asacol. So I’m home researching ulcerative colitis. This is a terrible disease and you have it for the rest of your life. Only one thing bothered me about it. It was a young person’s disease. While I was reading WebMD, Health Line, Heath net, etc. I realized I forgot to ask the doctor a question. It was a stupid question and everyone probably knows the answer—but me. I had never lost a fingernail and I was wondering if I was open to infection. Should I cover the nail beds with bandaids—all 20? Before I bothered the doctor with a stupid question I thought I’d try to find the answer myself. I was sick of the medical sites, so I just googled, “Loss of fingernail.” That’s all—3 words. Google gave me lots of choices. I took a deep breath and clicked on the first one—Cronkhite Canada Syndrome. I read it. My. Jaw. Hit. The. Floor. I was reading a description of myself. What convinced me was the fact that the average age was 59. My symptoms started when I was 59. Meanwhile, he sent my labs to a pathologist. At my next appointment, he said it did indeed look like I had CCS. He hadn’t heard of it since med school. But he had one more test to confirm the diagnosis and that was an endoscopy. The endoscopy showed that my entire digestive tract was full of polyps. No wonder I had diarrhea. My memory fails me but I remember having another colonoscopy or two. Anyway, we discussed what meds to take. Since the colonoscopy showed that my polyps were shrinking, then the medicine asacol was working. We decided I was doing fine with just that. I was also told to take vitamins and minerals and protein powder and (get this) nine eggs a week (9!!!). I was also sent to the dermatologist. This was at the same hospital as my gastroenterologist. They proved to be useless, although at first I was impressed with them. Firstly, they not only knew what CCS was, they were excited about it. Second, they took pictures of my head, hands, feet, nails, and skin. Interns came in to see. Lastly, I also consented to go on rounds with them. After doing all this for them, they were no help, whatsoever. They didn’t say what to do to get my hair and nails back. No lotions or prescriptions—nada. The last time I saw them, they said they’d be in touch. I’m still waiting. I went to the chief dermatologist, six months later for a check up, and told her that I was still waiting for instructions and she said she’d tell the chief resident to get in touch with me; I’ve been waiting ten years. Well, my hair and nails came back without their help. The asocol worked gently. My diarrhea slowly ended. I always wore a diaper. After about three weeks to a month, the diarrhea slowed down in that it wasn’t constantly pouring or dripping out. I would feel it coming and make it to the bathroom. My movements were still diarrhea, but they were controllable. This was monumental. I could actually leave the toilet for longer and longer periods. After about a month, I thought it was lasting longer and longer. I started writing down how many times I went to the bathroom. The first day it was 42 times. The second day 42. The third day 41. The fourth day 40. Etc. I know people would exclaim, you went to the bathroom 42 times!!! Yes and I was grateful for that because that was better than constantly sitting on the toilet with diarrhea. The diarrhea changed to just soft stools, and I think you get the idea. Enough of that. My hair came back but not as good as before. I used to have beautiful thick hair. It came back white (I don’t dare color it.) and sparse. There’s no hair on the sides and there are spots in the back where there’s no hair. My nails were the last to come back and it didn’t look like they were normal, at first. I thought they were growing back straight up in the air, but they did come back. In fact, they came back better than before. My nails were also very soft and I could never grow them long because they were so soft they bend over my fingers instead of growing long. But they came back healthier and strong. They are beautiful. I think it’s due to the vitamins and minerals and protein supplements. One odd remembrance about my emotional and mental health: I think I was in depression but as I got better, my mental and emotional health got better. For some reason, I couldn’t look people in the eye. I kept my head down and I would say to myself, “look up, look up.” I couldn’t. I could not force myself to put my head up and look at people. Weird. I don’t know whether I didn’t want to see the shock in their face when they saw me, or pity, or what? I often wonder what my problem was. It’s been 12 years since CCS. Do you know that the disease was named after Drs. Leonard Conkhite and Wilma Canada in 1955. And they were working in Boston hospitals, at that time. A couple of the dermatologists I met doing rounds, actually knew them. My gastroenterologist, Dr. Harry Anastopolous wrote an article on CCS and presented it at some gastroenterology meeting, using my colonoscopy and endoscopy pictures. He seemed pretty proud of those pictures. The pictures were in New England Medical Journal as Image of the Month. I forget the month but the year was 2007. I think going through CCS aged me, prematurely. Cataracts grew in my eyes, practically immediately. I tried to ask the ophthalmologist if CCS had anything to do with the fast growth and he didn’t know what I was talking about. I also had a little gum problem and asked the dentist about CCS affecting it and he thinks it could be related because with CCS my nutrition wasn’t what it should have been. And just the fact that my hair looks like old people’s hair, convinces me that CCS aged me faster than usual. Do you know what I mean by old people’s hair? Think of the hair on the old ladies in nursing homes, compared to a regular elderly lady. I think you can tell someone’s health by their hair. (CCS taught me that). They say that CCS is caused by stress. At the time, I had no stress. The most stressful time in my life was when I was 21-22. So I don’t think stress causes CCS since it’s an older adult disease; although it could be an accumulation of stress. I’m a sanguine/phlegmatic personality, so I don’t show stress, but being human I must have it. More people die from it since it is an elderly disease. I was 59-60 when I got it. I was healthy and could fight it off until it worked it’s way through me. But if I were in my 80’s or 90’s, I doubt I would have lasted. However, the most important thing I learned from the experience is to trust myself. I’m the one who diagnosed myself—with google! The doctor thought it was ulcerative colitis. Doctors may be experts in their field, but I’m the expert on “me.” I know me best. I also learned that a sick person should bring along another person to hear. My husband came with me most of the time and we were amazed at what I thought I heard and what he had heard was different. Support is always welcome. Presently, I’m a healthy 70 year old, who thinks back on her CCS experience as a crucible of fire. I survived it and am all the better because of it. Thanks be to God.